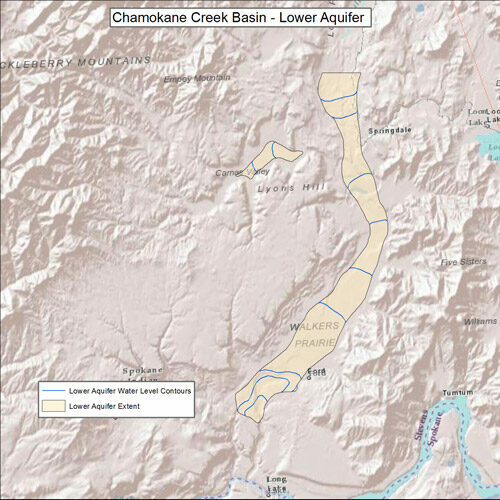 The Chamokane Basin Lower aquifer is a confined aquifer consisting of sand and some gravel that occurs at depth in the Camas and Chamokane Valleys below the Valley confining unit. The Lower aquifer is continuous northward into the Colville Valley. The approximate southern extent of the Lower aquifer is shown as being truncated near Chamokane Falls based on surficial outcrop of bedrock in that vicinity and well records that indicate the absence of a lower aquifer. The Chamokane basin Lower aquifer does not appear to be connected with similar deposits along the Spokane River. The thickness of LA is not well known. Two data sets are available, 1.the lower aquifer extent, and 2. lower aquifer water level contours. Both data sets are from USGS Scientific Investigations Report 2010-5165.